FAQs, Laboratory Quality Controls, Calibration Verification Material | AUDIT MicroControls, Inc. Question #1: Do I need to do anything to prepare this material? Answer: No, just follow the instructions as per the instructions on the package insert and test it like you would a patient sample. Question #2: How many times do I need to run the linearity? Answer: CLIA regulations do not specify how many replicates of each level of calibration verification should be run, however, we recommend testing it at minimum in duplicate or triplicate. Question #3: What do I do with the results to get the graphs/reports? Answer: You can either enter them on our online program, Auditor QC, which is accessible through our website, www.auditmicro.com, or you can send the data to us, Technical Solutions, to create the graphs for you and have them returned via fax or email. You can choose whichever is easiest for you. Both services are completely free. Data can be faxed to: ATTN: Technical Support, (706) 485-2123. Please make sure to include: Contact information, the analyzer the material was run on, and the lot number of the Audit MicroControls product to assure that we plot against the correct set of peer data. Question #4: How do I know if I have passed or failed? What are your acceptable limits? Answer: Now, we can’t tell you if your linearity has passed or failed, however, we do offer various statistics and data to assist you in making that decision. As per CLIA regulations, each laboratory is responsible for determining whether or not their calibration verification results are acceptable. When looking at the printed reports, you will have two sets of graphs. One that just plots your data as is and the other graph that compares you against the Peer Group (which is comprised of other labs testing the same material on the same, or similar, analyzer that you are using in your lab). So, when you are looking at the top graph, you should see three main components: a slope, a coefficient R (also referred to as R-Squared), and an intercept. This information summarizes your linearity results. The slope tells how close your values are (for all five levels on average) to what you should be getting (for all five levels on average). We don’t have any requirements on this since this can vary from facility to facility, but most labs we work with like to use a (+) or (-) 10% when applied to a slope of 1.0 (If you are getting a slope of 1.0 then you are matching up perfectly to what you should be recovering). If you choose to use this percentage, then the slope range would be between 0.9 - 1.1. We have worked with labs who have chosen to use a broader range such as +/- 15% or 20%. This will broaden the acceptable range of the slope. The next thing is the coefficient R (R-Squared) which tells how linear your results turned out for all levels. Many labs use a range to be between 0.98 - 1.0. If you get a 1.0, then it is simply stating you your data points line up perfectly on a straight line. Please keep in mind that each lab is responsible for establishing acceptable parameters. The last item is the y-intercept. Mathematically speaking, this is the value of y, when the line of the graph intersects the y-axis. The inspectors we have communicated with do not appear to be concerned with the intercept value. However, if your facility is in the state of New Jersey or New York, we have noticed that many state inspectors there would like to see this number as close to zero as possible. The information/chart down below in the bottom graph under the heading of User vs. Peer Comparison provides additional statistics and results. You can use them as additional tools to set up your acceptable guidelines if you like. There is nothing stated from any inspecting organizations that you have to use this informaiton. They are just merely there as a form of giving you more information to assist with compliance. And if anything is not within your acceptable limits, contact AUDIT MicroControls Technical Support for assistance. We can be reached at: (866) 252-8348. Question #5: If I want to perform a dilution, what do I dilute with? Answer: Please contact Technical Support for assistance. We can be reached at: (866) 252-8348. Question #6: I am getting a “suppressed” value, (</>) value, or nothing for level “X”. I am not getting values for all five levels. What do I do? Answer: A suppressed value (</>) simply means that the concentration of that particular analyte is either too low or too high for your instrument to read, so you might have to perform a dilution. Please do not enter in a less than (<) or greater than value (>), or any non-numerical value, on Auditor™ QC since this is not considered a valid point. However, some instrument manufacturers do accept these values as valid data points. I would recommend checking with them first about this. Question #7: What do I do with results I got from performing a dilution? Answer: Please send those results to us at Audit Technical Support so we can create a custom graph. Do not enter the values into the Auditor™ QC program since the online program does not recognize dilutions or blend values. It only accepts values that were obtained with the material that was tested neat. Question #8: I am running a Siemens specific AUDIT MicroControls calibration verification kit on a Siemens Centaur® and my values do not match up well with the expected Siemens values on the package insert. What should I do? 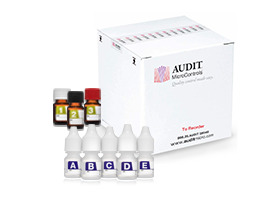 Answer: As a first step, we always recommend that when analyzing your laboratory’s results to either go online to our website at: www.auditmicro.com and enter your data on our Auditor QC Program or to send the data to us at AUDIT Technical Support and allow us to plot your results in order to get real time peer data comparison. Please note that reagent lots should not be changed during the testing of the calibration verification material, as that can adversely affect the results. More specifically, please run the Audit MicroControls Cal Ver material with a single lot of reagent. Please keep in mind that the values printed in the package inserts of the Siemens specific AUDIT products are provided to us by Siemens after testing that lot of material at multiple Siemens designated laboratories and after numerous replicates have been run. If you are still experiencing issues with your recovered results, we recommend that you call AUDIT Technical Support at (866) 252-8348 so that we can further assist with troubleshooting. Question #9: I plotted my results on Auditor QC. My graphs do not look linear and there are no peers for my analyzer. What should I do? Answer: It can take time to populate the peer data whenever there is a new lot of AUDIT calibration verification material released. However, with more than 4,000 customers using our products, the peer data populates very quickly. We usually have peer data for the majority of the more commonly found analyzers within a week of a new product lot release. Of course, in situations where a customer is running on a less commonly used analyzer, it may take more time to generate additional peer data to compare against. In these cases, AUDIT is very proactive and works closely with our customers to expedite the peer population for that particular analyzer. We have great relationships with many instrument manufacturers who are usually very willing to run material for us. We are also more than happy to provide calibration verification material to other labs that you may know of who are running on the same instrument in order to speed up this process as well.